This post is intended to show what linguistics can offer marketing. I’ll be using corpus linguistics tools to analyze a few pieces of advice about how to write better marketing copy. The idea is to empirically test the ideas of what makes for more profitable marketing. But first, a quick note to the marketers. 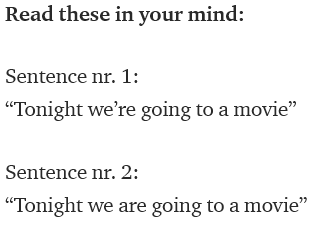 Linguists, please leave the room. Note to marketers: Corpus linguistics works by annotating texts according to the linguistic features that one wishes to study. One of the most common ways is to tag each word for its part of speech (noun, verb, etc.) and that is what I’ve done here. Corpus linguistics generally works better on longer texts or larger banks of texts, since the results of the analysis become more accurate with more data. In this post I’m going to do a surface analysis of email marketing texts, which are each 250-300 words long, using corpus linguistic methods. If you’re interested in knowing more, please feel free to contact me (joseph.mcveigh@gmail.com). In fact, I really hope you’ll get in touch because I’ve tried again and again to get email marketers to work with me and come up with bupkis. I’m writing this post to show you exactly what I have to offer, which is something you won’t find anywhere else. Welcome back, linguists. So what I’ve done is gathered ten email marketing texts and ranked them based on how well they performed. That means I divided the number of units sold by the number of emails sent. I then ran each text through a part-of-speech tagger (CLAWS7). Now we’re ready for action. Let’s start with a few pieces of advice about how to write good marketing copy. I want to see if the successful and unsuccessful marketing texts show whether the advice really translates into better sales. 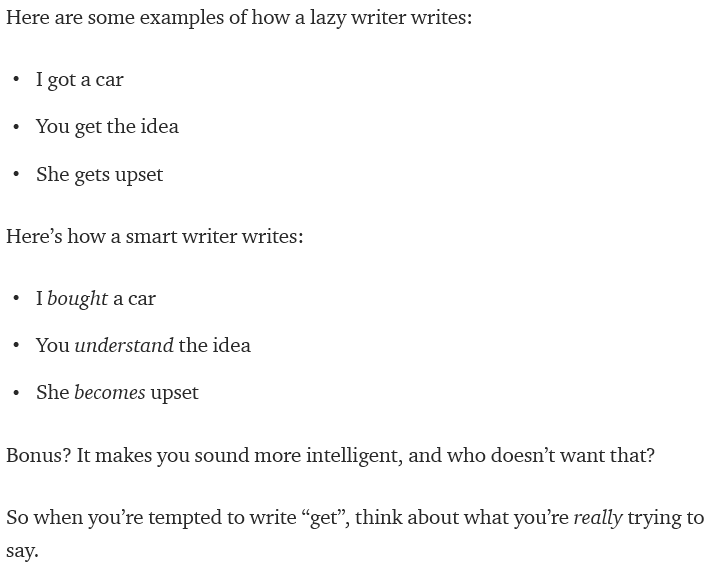 The first piece of advice goes like this: Don’t use BE verbs in your writing. This means copywriters should avoid is, are, was, were, etc. because it apparently promotes insanity (test results pending) and because “we never can reduce ourselves to single concepts”. If it sounds crazy, that’s because it is. And even the people who promote this advice can’t follow it (three guesses as to what the fourth word in the section on that page introducing this advice is). But let’s see what the marketing texts tell us. Who knows, maybe “to be or not to be” is actually the most memorable literary phrase in English because it’s actually really, really bad writing. 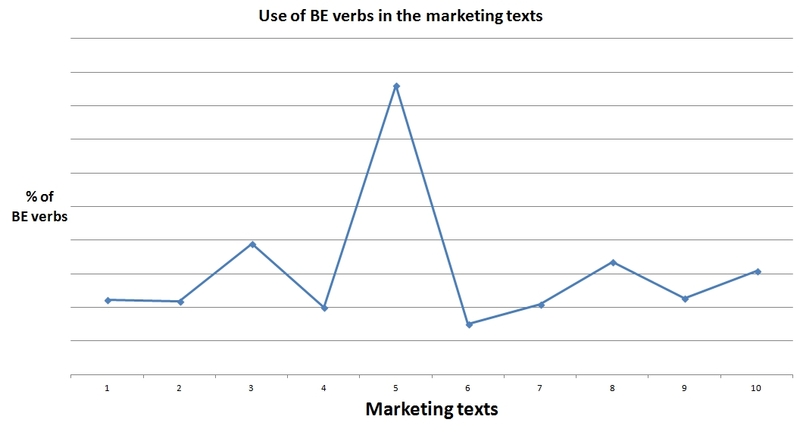 In the chart below, the percentage of BE verbs used in each texts are listed (1 = most successful text). The differences seem pretty staggering, right? Well, they would be staggering if I didn’t tell you that each horizontal axis line represents a half of a percentage point, or 0.5%. Now we can see that the differences between the texts, and especially between the best and worst texts, is practically non-existent. 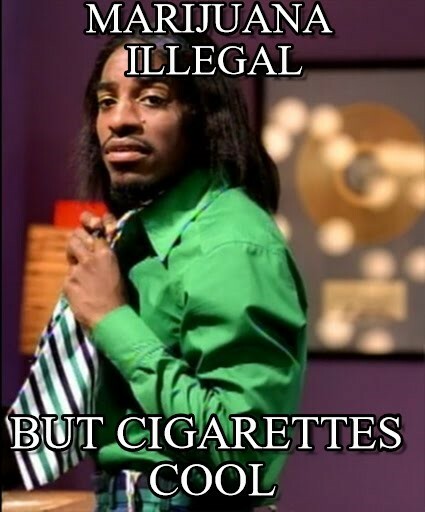 So much for being BE-free. The second piece of advice is about the misuse of adjectives. 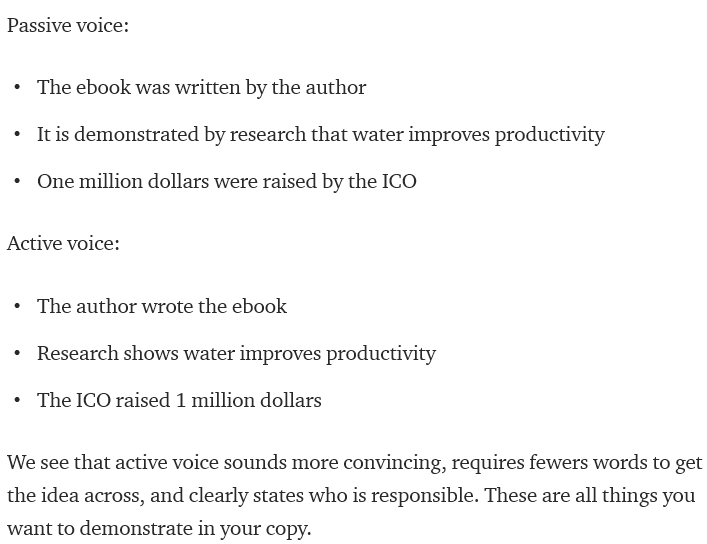 According to some marketing/writing experts, copywriters should avoid using adjectives at all because “They are, in fact one of the worst [sic] elements of speech and even make a listener or reader lose trust”. Sounds serious. Except for the fact that linguists have long known that avoiding adjectives is not only bad advice but impossible to do, especially in marketing. How’s that? Well, first, this is another piece of advice which is given by people who can’t seem to follow it. But let’s say you’re trying to sell a t-shirt (or a car or a sofa or whatever). Now try to tell me what color it is without using an adjective. The fact is that different writing styles (sometimes called genres or text types), such as academic writing, fiction, or journalism, use adjectives to a different extent. Some styles use more adjectives, some use less, but all of them use adjectives because (and I can’t stress this enough) adjectives are a natural and necessary part of language. So writers should use neither too many or too few adjectives, depending on the style they are writing in. But we’re here to run some tests. Let’s take the advice at face value and see if using less (or no) adjectives really means sales will increase. Again, the differences in the results look drastic and again looks can be deceiving. In this case, the horizontal axis lines represents two percentage points (2%). 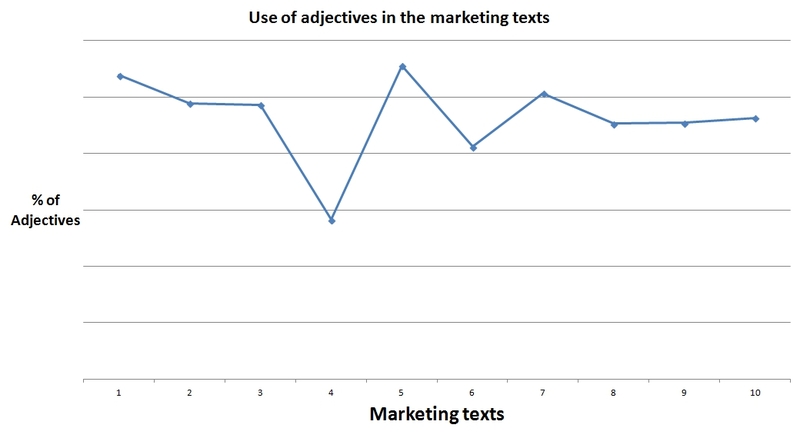 The percentage of adjectives used in the three most successful and three least successful marketing texts are nearly identical. In fact, they are within two percentage points of each other. Another one bites the dust. UPDATE August 22, 2013 – I’d like to mention that the use of modifiers, such as adjectives, is a good way of showing the depth of my research and what it can really offer marketers. While we saw that adjectives in general, or as a class, do not tell us much about which marketing texts will perform better, there are other ways to look into this. For example, there may be certain types of adjectives common to the successful marketing texts, but not found in the unsuccessful ones. Likewise, the placement of an adjective and whether it is preceded by, say, a determiner (the, an, etc. ), may also be indicitave of more successful texts. And in a similar fashion, texts which use nouns as modifiers instead of adjectives may be more successful than those that do not. The important thing for marketers reading this to know is that I can research all of these aspects and more. It’s what I do. The final piece of advice concerns the use of the word you, which is apparently one of the most persuasive words in the English language (see #24 on that page). Forget about the details on this one because I don’t feel like getting into why this is shady advice. Let’s just get right to the results. Does this chart look familiar? This time the horizontal axis lines once again represent a half of a percentage point. And once again, less than two percentage points separate the best and the worst marketing texts. In fact, the largest difference in the use of you between texts is 1.5%. That means that each one of the marketing texts I looked at – the good, the bad, and the in between – uses the word you practically the same as the others. It would behoove you to disregard this piece of advice. I’ll admit that I picked some low hanging fruit for this post. But the point was not to shoot down marketing tips. The point was to show email marketers what corpus linguists (like me!) have to offer. Looking for specific words or adjectives is not the only thing that corpus linguistics can do. 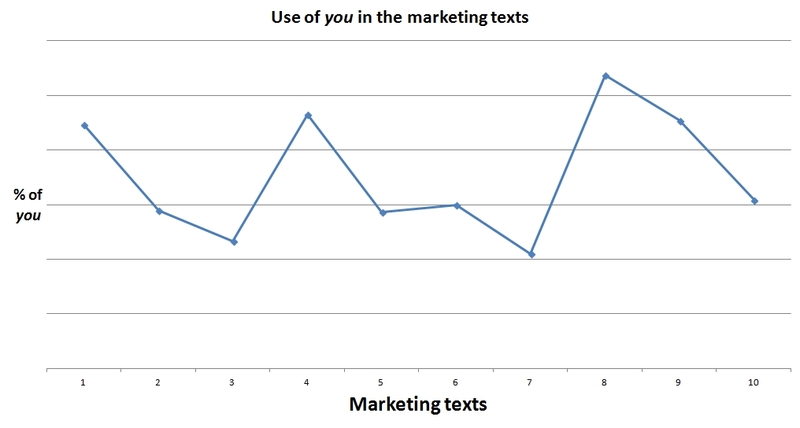 What if I could analyze your marketing and find a pattern among your more successful texts? Wouldn’t you like to know what it was so you could apply when creating copy in the future? On the other hand, what if there wasn’t any specific pattern among the more successful (or less successful) texts? What if something besides your copy predicted your sales? Wouldn’t you like to know that as well so you could save time poring over your copy in the future? Really, if you’re an email marketer, I think you should get in touch with me (joseph.mcveigh@gmail.com). I’m about to start my PhD studies, which means that all my knowledge and all that corpus linguistics has to offer could be yours. How about letting me analyze – and probably finding an innovative way to improve – your marketing? Sound like a good deal? If so, contact me here: joseph.mcveigh@gmail.com.